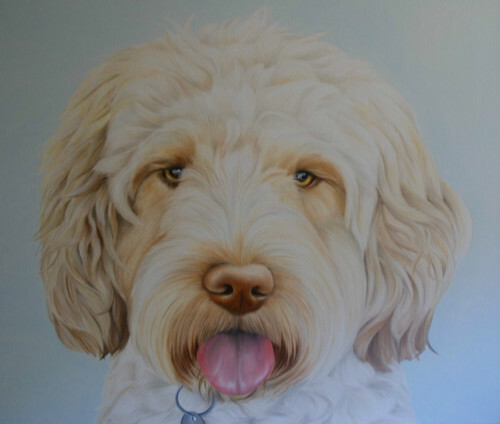 On the first day I got to meet Judi and her lovely daughters who noticed the Spaniel painting I had on display so came over for a chat, unfortunately they couldn't bring Boris their Cockapoo in but he was happy in the car with his Dad which worked out for the best as Judi decided to commission a portrait of Boris as a surprise present for him. The following week I drove over to meet Boris and was greeted by a very happy, excited and some what fluffy Cockapoo, obviously I fell in love with him straight away (one of the perks of the job!) I bought my camera along and we had a good play in the garden and I took plenty of pics while he was running around after his frisby and cuddly duck toy, I got some great shots while he was waiting patiently for Judi to throw a toy for him, I have a feeling he could have done this all day! Thankfully the joy of a digital camera meant I could take hundreds of pictures to really make sure I captured his personality. 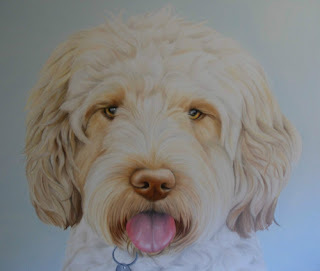 I somehow managed to whittle down to just 8 final pics which I sent over to Judi for her and her daughters to look through before deciding on the final one to use as the basis for the painting, it was a tough choice as he looked gorgeous in every one but I definitely think they made the right choice! We went for a X-Large Canvas which suits his larger than life personality, I have to admit I do love doing the larger canvases, I feel you can capture so much more detail and the painting has a real impact, although you have to make sure you have the wall space! "We met Lucy at the Larmer Tree and admired her work. She came to our house and took some super photos of our cockapoo Boris. The painting she produced is fantastic and has really caught his character. Lucy was a delight to deal with, and we strongly recommend her as an artist."